Urban Tree Farm Nursery provides countless varieties of shrubs, grasses, vines, fruit and ornamental trees to consumers and landscapers alike. We are certain to have the Nursery Stock you are looking for! Is it a shade tree you are looking for? If so, we’ve got you covered! Perhaps you require a Large Specimen tree for that newly acquired estate or winery project? Urban Tree Farm Nursery can meet those needs as well; for example, we stock 100yr old olive trees, boxed and ready to be transported to your location, in addition to many other trees. 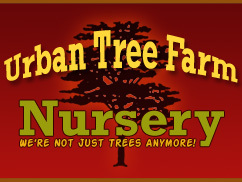 Speaking of transport... Urban Tree Farm Nursery will deliver product throughout the northern, CA region. Please refer to Delivery Prices for specific information. If you reside in an area not indicated on our list, please don’t hesitate to Contact Us for a quote. One of our courteous and knowledgeable staff members will be happy to provide a guided tour of our beautiful 20-acre facility via a ride in one of our eco-friendly carts, and answer any specific questions you may have. In order to start your planting endeavors off on the right foot, we have compiled and provided an assortment of free guides. Be sure and view our Planting Guide, Bare Root Planting Guide and Pollinizer Information guides. These guides are available for download or print. Feel free to browse our Catalog of available product. Simply select the main category you are interested in viewing, then select the specific species, where you will find a description and the ability to view an enlarged photo of the item. Also, a Price List of our complete inventory is available in a printable format for your convenience! The combination of “green” farming techniques and the expert care provided by our staff, along with our blessed geographic location, create a positive synergy conducive to growing some very happy plants! Be sure and come see us soon!